I first encountered Pablo Neruda when I was seventeen years old. See, I had a huge crush on a boy who would carry a dog-eared copy of Twenty Love Poems in his back pocket. With his wave of dark hair and a sway in his step, I would long for him from afar. I thought that if I began reading Neruda’s work that I would finally be able to gather up the nerve to speak to this quiet, yet thoughtful and intriguing young mystery. 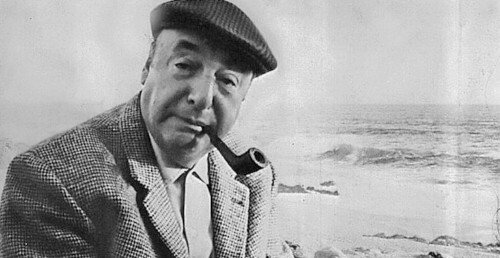 Although no love was found with this boy, it was the beginning of my love affair with Neruda. As I grew older, I immersed myself in his pages. Late nights, I would read his poems and imagine they were written for me, about me. I let him live in my veins until I could sense his rhythms drunkenly sailing on waves, my pockets full of his stones sinking to the ocean depths. I buried his head in my gut and let his simplicities make love on my lips, licking syllables of blooms and bones. His world of natural imagery layered the patchwork of his love, and I became seduced by it. Many years later, while traveling in Chile, I had the opportunity to visit his homes in Santiago and Valparaiso, gaining further insight into the man behind the words I had become so passionate about. I peered though windowpanes he’d draped, listening for creaks in floorboards his weight would have made at dawn. My hands splayed on wood where pages formed, heart to ink. Rooms full of oddities; flamingos and buoys, collections of colored glass, African masks and wind chimes. I imagined this space as a physical representation of his personal complexities, a physical love poem to the love of his life. Even after all this time, rereading poems that I’ve read a hundred times, he speaks what my heart can not. Meverette Smith grew up in Takoma Park, MD and attended Fordham University in New York where she studied theater and creative writing. Mev is a proud founding member of the writing group, Writeous, which formed in 2008. Writeous published several chapbooks and with the group she participated in several reading engagements in and around New York City. Mev was a featured poet in the Glitter Pomegranate Reading Series and performed her work with the Composers Concordance in their Poetry & Music – Unhinged festival.